Something of a Thornbury institution, Tasos is a great place to head to for breakfast or morning tea after grocery shopping at Psarakos across the road. Their breakfast menu is straightforwad: there's toast with spreads (including marscapone and jam), pancakes with or without bacon, and eggs how you like with the extras you like. More impressive is their array of cakes and delicacies: caramel tarts, mud cake, cheese cake, baclava, canoli...it's extensive. Their website features some very impressive photography work that only slightly exaggerates the effect of looking at their front window display! Customers coming in to collect enormous special occasion cakes is a regular event. 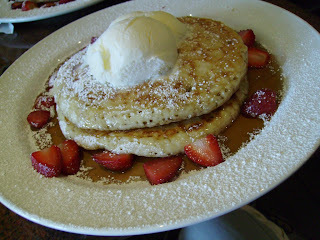 We go for the pancakes: At $6, they don't get in the way of the grocery budget! The best thing is they're deftly-made: light and fluffy. It was these I was thinking of when I was chewing through the stodgier fare at Twist in Newcastle. As long as you pay a little bit of attention you can control the maple syrup to pancake distribution. And starting the day with strawberries and ice cream is always a good option!